I was asked the question below and I thought that it may help somone else out. Question:	QUESTION: We have decided to stay in Circus Circus. We will fly in from rural Oregon for 4 days. The hotel is cheap, but the flight is expensive. The kids are 12 & 14. We found a plane & motel package for $1400. It gave us 2 free show tickets. In general, can we get discount tickets for the kids? How are the crowds in the amusement park and midway over this holiday. We are considering the $25 all day buffet. Do we have to plan our meal times around crowds? Is an indoor pool and option anywhere-should we even pack swimsuits? How safe is the hotel? Do we need to be with our kids inside the hotel’s attractions? They are good kids, but shy and not worldly or used to cities. 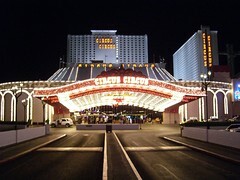 How do we get from Circus Circus to see some of the free sights at other hotels? Can we walk? OK firstly when you get to Circus Circus please ask for an upgrade the cheapest rooms are the old motel rooms I think that they are called Manor Rooms it is worth paying the surcharge to stay in the towers if the $20 trick (shown bottom of post) is not successful. The manor rooms are away from the main casino and just not very nice. The amusement park does get crowded just like any other theme park in peak times and whilst it is the biggest indoor theme park it is not as big as even a modest open air park. I have ridden out of season midweek and there were no lines for anything I would suggest that you get their as soon as it opens stay for a few hours and as it gets busy go off and explore something else. There are not that many shows that will offer a discount for the kids Vegas is seen as an adult resort and whilst there is plenty for all the family the shows tend to think that if they discount a seat to a kid they have lost out if another adult had bought it. However you don’t have to pay a lot of money to see a show in Las Vegas. What we tend to do is look for one show that we cant miss and book that at full price before we go then we have a look at http://www.goldstar.com (you need to join but it is free to do so) and see if there is anything we fancy the look of there we saw a Hypnotist for about $4 once, we also go to the booths on the morning of the day we want to find a show and take what seems good value on that day they change every day. http://www.tix4tonight.com/ get the coupon and print off before you go. Sorry you have not said when you are going so I cant tell you whether you can swim or not there are no public indoor pools on the Strip in fact that only one I have been to is at Tropicana and that is a sad affair and really not worth it. I am not happy to say whether the hotel is safe or not as that puts a responsibility on me and what I consider safe and what you do may well differ it is worth noting that there is CCTV everywhere inside the casinos and a large number of security staff. I generally feel pretty safe anywhere on the Strip and in most areas of most casinos. You will need to be with the Children anywhere near the casino floor you should be able to leave them on their own if you choose to whilst in the theme park and of course they can walk around the Strip on their own but to be honest you are probably better off at night walking with them. You can easily walk from CC to the other casinos it is probably about 20 minutes from CC to Treasure Island (or TI as it is now known) and from there the rest of the Strip is easy or you can walk to the Sahara and get on the Monorail. Encore is probably about the same walk maybe slightly less. I would suggest that at night you get a cab to or from these places its not that it is unsafe but particularly the walk to Sahara but it can feel a little unsafe and you don’t want to feel like that whilst on vacation and cabs are very cheap in Las Vegas. $25 per day is of course excellent value but yes you have got it in busy times expect a long wait the other problem that you have is that the food will be very similar from one day to the next and you may get bored with it but as I said it is great value and you know you will be full up and that you will get free soft drinks. There are still good cheap options to eat in Vegas we never ever leave town without going to the Peppermill (http://www.peppermilllasvegas.com/restaurant/index.html) which is a Vegas institution cheap, huge portions and open 24/7 this site shows the menu for there and other places Peppermill Las Vegas We also allays have at least one breakfast at IHOP and have been known to pop in to Dennys. If you decide to go downtown (Fremont Street Experience is something you children will love) eat down there far cheaper than the Strip buffet at Golden Nugget is excellent, you can get downtown on the bus for $2 each. Lets face it though whatever you do (even McDonalds) you are not going to be able to do that on $25 a day. MGM Grand and Excalibur are also both very good choices to stay if you have kids.